Bolivian Thoughts opinion: Bolivian physicians have tried for the last 30 days to stop an irrational central government regulation that basically could send any Bolivian professional: to lose his professional license, his savings and freedom, in cases of shady “malpractices.” The populist, demagogue government of the coca caudillo has purposely going after the physicians to divert attention on the poor performance of this government regarding public health. After 12 years of absolute control of ALL State powers, mismanagement and waste of over $160 billion dollars, this inept demagogue government is following the guidelines of Cuba and Venezuela … to perpetuate in power and to maintain evo in power. On the one hand, I’m happy to see my country fellows fighting against this delusional demagogue government. Our Milenials have rightfully taken the lead to fight for our rights as citizens of this beautiful country. On the other hand I am of course sad to witness how badly our country is going … how this caudillo has destroyed our institutionality, our sense of fellowship … sad to have witnessed how our 35 years of ongoing democracy is going down hill, just to please this egomaniac. My Facebook page is full with videos and information about the excessive use of force of the Bolivian police to physician professionals and students, use this link to interact, thank you. 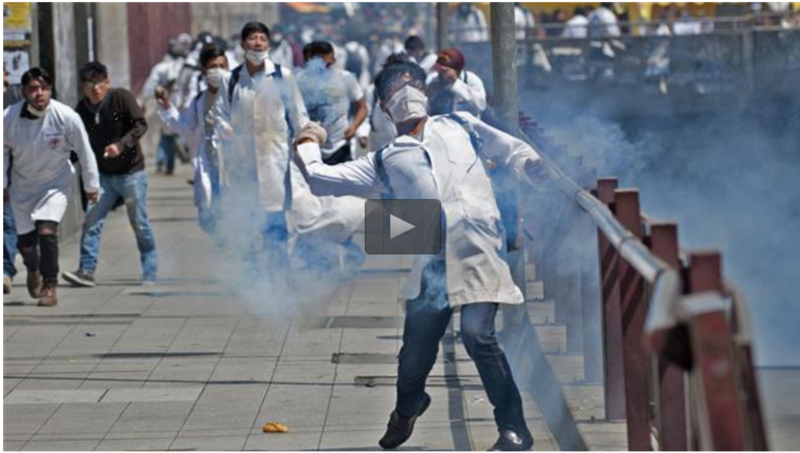 Clashes erupted for the fourth consecutive day during a medical student protest in the vicinity of the Ministry of Health and the University of San Andres in central of La Paz on Friday. Demonstrators continued rallying against Article 205 of the new penal system code and against apparent police repression during protests of the same nature. 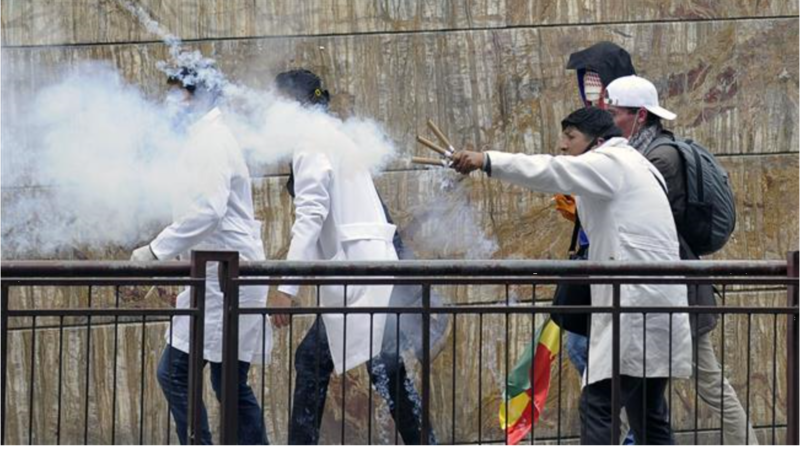 The clashes left 17 injured and three others were arrested, with protesters throwing stones and firecrackers and riot police responding with teargas. Article 205 of the new penal code was approved by the Senate earlier this month and sentences medical staff, who are guilty of professional negligence that causes injuries or death, to jail. Professionals from the medical sector have been reportedly protesting for 30 days. This entry was posted in Bolivia, La Paz, Politics, Social Unrest and tagged demagogue, democracy in peril, government failures, police aggression. Bookmark the permalink.